Yesterday the office went out for lunch at a restaurant down the street. I've never had my camera on me the times we have been out before, but today I did so I figured I would post a little about a typical lunch time meal today. 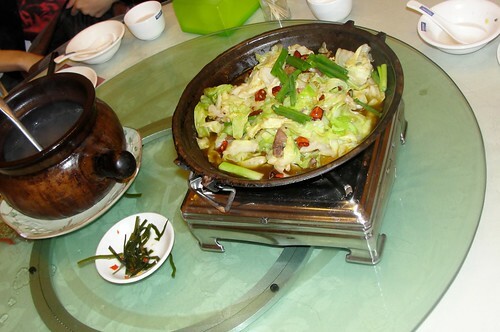 This type of food is traditional from the Hunan province which is located here. This is a typical place setting when you arrive. Maybe times they are actually disposable. 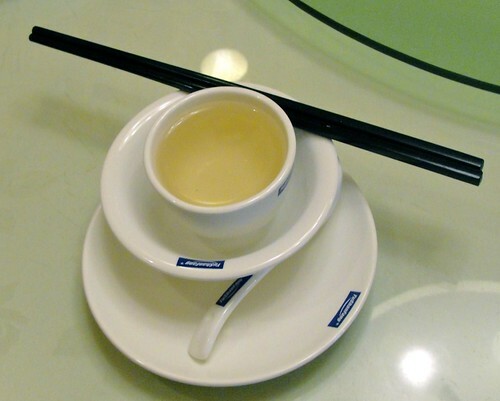 The liquid in the cup is Chinese tea. 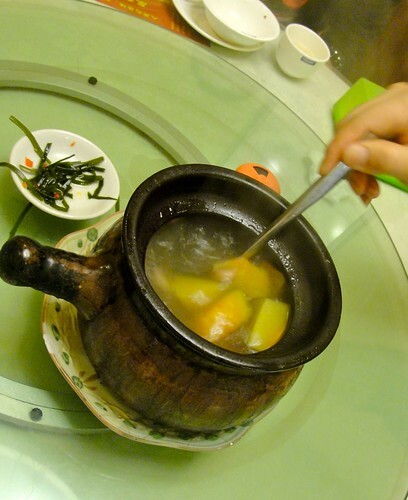 Tea is usually had before the meal, not after like in the US or Europe. I have yet to come across a Chinese tea I dislike. Here is more of what the soup looked like. 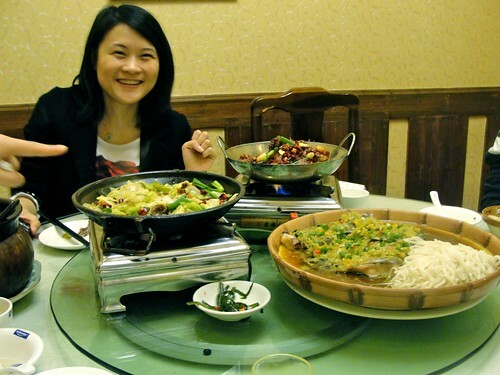 Most meals in China are served quite differently than in the US. 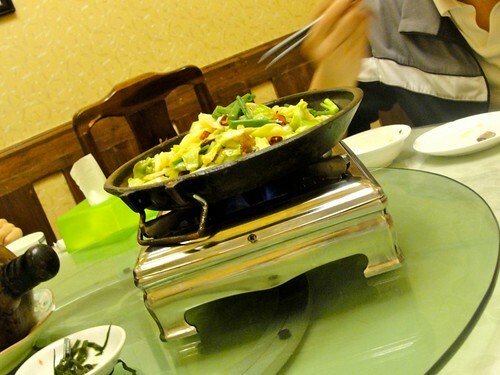 Here, instead of individual meals, 4 or 5 dishes are ordered and shared on a lazy Susan and everyone get their own bowl of rice to put the food on. 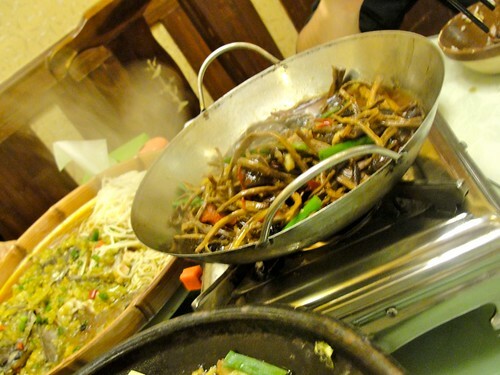 Not having enough food is considered VERY bad form, so there are is ALWAYS too much ordered. Typically the dishes come out one after another. The first dish out was this one. Mostly cooked cabbage, chives, hot peppers, and mushrooms in a spicey soy like sauce. My personal favorite of the day. 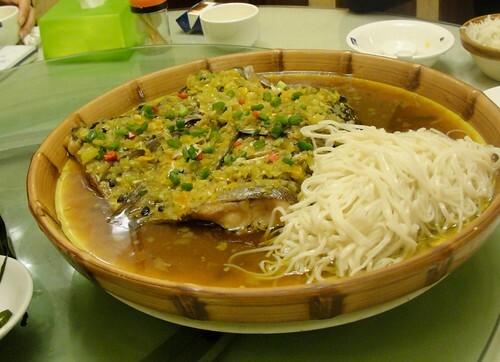 Next out was some fish and noodles. I have no idea what kind of fish it was. The sauce was very garlicky with maybe some lemon. I also noticed it had a similar taste to the sauce Lindon's mom taught me to make for the dumplings. I think it has something to do with the untranslatable sauce used. I liked the sauce and noodles, but no surprise that the fish was not for me. 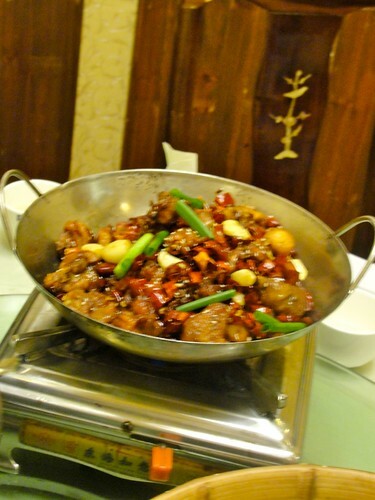 Next came a spicy chicken dish. This tasted pretty good, but having the bones still in the meat is a little weird for me. 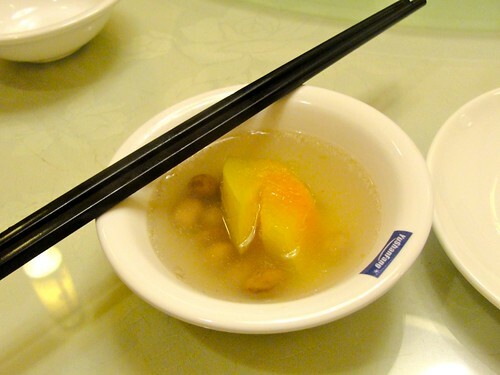 I think that the person who originally came up with American Chinese food maybe have experienced and tried to recreate something like this originally. This assumption is mostly based on the way the food looks and a few of the ingredients. The taste is still no where near the same. 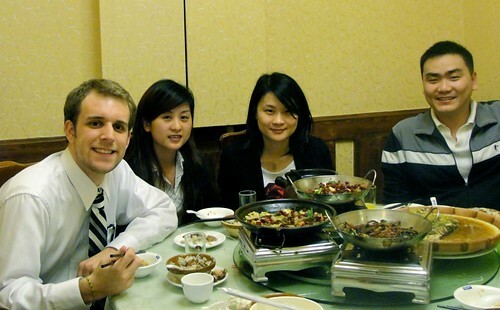 The smiling girl in the back ground is Lily, she is the Engineer at our company. Here is a closer look at the chicken dish. Finally the last. A mushroom based dish. I was so stuffed at this point I didn't get a chance to try it. And finally a picture of all of us. Can you spot the foreigner!? To really illustrate what I mean by always ordering too much, this is basically the end of the meal and all the food you see is left overs. Fortunately it doesn't go to waste and taking food home here is very normal. The whole affair, 4 people, 3 courses, 1 liter if soda, and tea cost us less than $30.00!